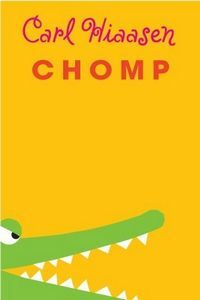 Chomp by Carl Hiaasen, a Mysterious Review. Review: After his father suffers a concussion from a frozen iguana falling from a tree and his mother goes off to China on a job assignment, it's up to young Wahoo Cray to manage the family's exotic animal zoo in Chomp, a comedy/crime novel for middle school readers by Carl Hiaasen. Mickey Cray, Wahoo's father, is still in charge of the household, the finances of which is seriously depleted, but is prone to sudden and debilitating headaches, leaving the task of feeding and taking care of the animals to Wahoo. Which includes a giant alligator named Alice that the producer of the reality series Expedition Survival! wants to feature in an upcoming episode. The star of the series, Derek Badger — not his real name, of course, but thematically more appropriate for the series — wants to wrestle the beast in the Everglades, but Mickey and Wahoo are having none of that. Since much of the show is staged anyway, they convince Derek to do a scene on their property, where they already have a mini-replica of the swamp built for just that purpose. Though everything that can go wrong does go wrong, there are no serious injuries — to man or animal — and everyone agrees that the footage captured by the cameraman will make for great television. Derek is so pleased hires Mickey and Wahoo to accompany him to the real Everglades, where Derek is convinced he can film even greater television. Chomp is an entertaining, if somewhat incongruously plotted novel. The writing is at a level understandable to the intended reading audience but it seems hard to believe that these young readers will relate to most of the story, in particular everything involved with the production of a Discovery Channel-style reality show that provides the structure for and backdrop to what happens. And then there's a briefly mentioned subplot involving the abusive father — "the king of fake tears and phony apologies" — of a schoolmate of Wahoo that seems really out of place here. (He takes on a larger, not unrelated role later in the book. However, other than a convenient means of introducing a character to tag along with Wahoo to the Everglades, it's not at all clear why child abuse has to be included here in any context.) Still, this is an adventure tale involving kids and exotic animals in unusual places and situations and that's probably what most readers will take away from it; and from this relatively narrow perspective, it's quite good. As of the date of this review, no Lexile measure has been assigned for this book. The publisher lists it as appropriate for readers aged 10 and older. Acknowledgment: Random House provided an ARC of Chomp for this review.